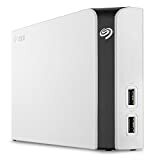 Are you considering purchasing a Seagate Game Drive for the Xbox gaming console, but don’t know if this is the best choice for you? Buying an Xbox One external hard drive can be a tricky decision in a gamer’s life, since there are so many options to choose from. However, picking the right drive for yourself will be easy once you know the necessary tips and tricks. There are many reasons to get an external hard drive which we will go over in the article. Continue reading to find out more about the Seagate game drive for the Xbox One. Before you check out our Seagate Game Drive for Xbox Review, be sure to browse this updated list of the top selling hard drives for Xbox One. The Microsoft family of consoles has a lot of Xbox gaming accessories to choose from for gamers looking to get the most out of their experience. And one of the most important of these accessories to own is an external hard drive. The benefits of owning an external hard drive for an Xbox console depends on a few factors. Like if you travel a lot then portability is a huge factor for you as a gamer. For example, if you want to play at a friend’s house having an external hard drive is optimal, since all you have to do is connect the USB. But for most of you who are here reading this, the biggest factor is probably storage space. If you’re on the fence or wondering why an external hard drive is so important then this section is for you. Below we’ve listed a lot of the benefits to owning an Xbox external hard drive. Whether it’s for the Xbox One, Xbox One S, Xbox 360 or the Xbox One X having an external hard drive can benefit you greatly. Most games these days are normally over 50Gb, which is a lot as the Xbox One normally comes in 500Gb or 1Tb sizes. This means at most you will be able to store around 10-20 games, however with an external hard drive that all changes. Being able to store content on a drive to use later is amazing for a gamer, because now you won’t have to delete games and re-download them afterwards. Also, hard drives can wear down and break, so if your Xbox One is not exactly new then having back up content on an external hard drive is a great idea. As mentioned previously there are many positives when it comes to external hard drives due to their portability. Whether that’s having the freedom to go to a friend’s house to finish a game you started or taking it on holiday. Furthermore, if you have terrible internet speed you now have the option to go to a friend or a location where there is fast internet speed and download games. This means you will no longer have to put downloads on overnight just to play the latest triple A games. Having to share a console between other people is a nightmare especially if you don’t have the same gaming taste as them, since you will most likely have different games installed. This means that you will run out of storage quickly as there will be many games in the console, however this doesn’t always have to be a minus. Obtaining an Xbox drive or for that matter an Xbox 360 hard drive can resolve the situation easily, because you can store games on there if the internal storage has no more space. All gamers hate loading screens and with good reason, they waste time and are annoying. However, there is nothing we can do about them, well almost nothing. Having games installed onto the Xbox One internal hard drive will make them load faster, since the internal driver will most likely have a faster SATA speed than an external drive. Therefore, getting an external drive to store games that you rarely play is a great idea, because now you will be able to load up games that you often play and when you get the urge to play other games they will be there stored on your external hard drive, thus no more needing to download deleted games. Changing the internal hard drive in a PS4 is fairly simple, but that cannot be said for its competitor the Xbox One. When it comes to changing the internal hard drive in an Xbox One it’s not that easy. Microsoft did not intend their users to do so and it shows. However, purchasing an Xbox One external hard drive solves most gamer’s problems without having the need to tear apart their console to change the storage space. It’s just a few simple steps and you’ll be able to increase your storage capacity without having to take apart your Xbox console. Depending on what console you have games can actually load faster on an external hard drive. For example, the Xbox 360 hard drive may be using SATA II, which is great for common gamers. However, having a drive with something along the lines of SATA III would make a huge difference in loading speeds. Xbox One external hard drives are great for loading speed, since they are faster than a lot of internal drives. Also, take note when purchasing an external hard drive that USB 3.0 is actually faster than SATA II. Another reason why external drives are faster is the fact that they don’t have to do as many functions, like running many apps or other Xbox features. Xbox One external hard drives are fairly simple to use, all you have to do is plug it into the machine and you’re already half way done. The next step would be formatting the driver for your console, which is not too hard as everything is made for the average user. Once the formatting process is completed you now have an external hard drive where you can store anything you like. Normally when buying a new console the internal drive would be 500 GB or 1 Tb. However, with external hard drives you have the freedom to pick whatever you prefer. If 1 Tb is not enough consider purchasing an Xbox One 2 Tb hard drive, which is a lot of space when it comes to storing games. Going this route is much better than having to change the internal storage yourself, since most people will break something when taking their Xbox apart. On the other hand, purchasing a 2 Tb Xbox external hard drive can be better, because they will have better features such as faster transfer speeds. You may have wanted to purchase an external Xbox 360 hard drive, but thought what happens when the next gen consoles come out? Not to worry most external Xbox 360 hard drives are compatible with the newer Xbox one. In addition, not only will you be able to use it for your console but also for PC’s. In retrospect you’re not only gaining an Xbox One external hard drive, but also a device to store information from your PC. This is especially a great way to transfer games from PC to Xbox, since nowadays there is an option to download computer games via personal computer. One of the great features of external hard drives is not being limited to options. Depending on what you need there is most likely a product for you. For example if you need a lot of storage there are Xbox One 2 Tb hard drives. On the other hand, if you don’t require much storage you can get hold of 500 GB drives. 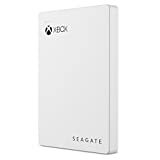 In addition, Xbox external hard drives come in all shapes and sizes so if style is a big factor then there are many great designs to choose from. Imagine playing an intense game online only to get the red ring of death and all data is corrupted, which means all progress in campaign games are gone. Luckily you bought an external hard drive and you can upload the data that has been lost. However, if you have no backup data then you wasted your time and money, as you will have to replay the games. This is one of the main reasons why getting an external hard drive is a must, spending hours upon hours on a game only to lose progress can be heart breaking. Also, another reason to get an Xbox One external hard drive is your console might become slow and sluggish with all the storage used up, thus transferring data elsewhere can help make your console load games faster. Before upgrading consoles you might still want to play some of your older games, which are more than likely to be compatible with newer consoles. This way you will be able to save time as there is no need for re-downloading games, simply pop the USB into the next gen console and begin gaming. Also, it would be a headache transferring all important data to other consoles, but with external hard drives you can do it without much trouble. In addition, you can transfer games to a friend if they recently bought a new Xbox One, thus you can start playing together in a hassle-free way. 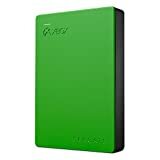 The Seagate game drive for the Xbox is great option for any gamer who is looking to improve their storage. This external hard drive comes in different sizes: 500 GB, 2 TB, 4 TB and 8 TB. So variety is definitely not a problem, depending on the games you play you can pick which hard drive is best for you. Play a lot of the triple A games? Then going for a bigger storage unit is the way to go. On the other hand, if you enjoy playing indie games then getting a smaller unit would be advised. Also, the pricing for the hard drive is not that expensive when compared to other Xbox One hard drives. However, the more space you need on the drive the more it will cost, since it’s a lot harder to manufacture bigger storage units. 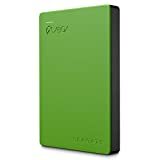 In addition, this external hard drive is very practical for the average user as the simplicity of the product makes it easy to use, simply plug it in with the USB cable and begin uploading. Although the design of an external hard drive shouldn’t matter some customers prefer a good looking product, which is why the designers made this hard drive stand out. The dimensions of this hard drive are 4.6 by 3.1 by 0.6 inches and weighs only 6 ounces, which is not too heavy. Also, the outer design is green and black, making it go neatly with a black themed Xbox One or Xbox 360. On the other hand, if the design doesn’t matter to you then just note that this hard drives is one of the better looking products on the market. One great feature about the Seagate Game Drive is that it can be used for multiple purposes, which makes it a bargain as it can be more than an Xbox game drive. Depending on your needs you can use this as a media storing unit or a game drive. Using it as a media transferring tool is not a bad option as you will be able to store hundreds of films depending on their size. Also you can store pictures and music, which you can then play through the Xbox One. On the other hand, using this external hard drive for what it was intended to do is a far better option, since it will fulfil your gaming needs. The first thing you must do is format the drive accordingly so that you can use it as a game drive, otherwise it will just be a storing unit. Once you have formatted it correctly you now never have to delete the games you want to play due to capacity problems. Next gen consoles are coming out every couple of years or in some cases decades, however that doesn’t change the fact that getting new external hard drives every time a new console comes would be a waste. This is way the Seagate Game Drive is a great option, since it’s compatible with older gen consoles like the Xbox 360. In addition, this hard drive can be used on PC, giving you even greater flexibility when deciding how to make use of it. This way you can download games via PC and transfer them to your Xbox through the hard drive. Furthermore, maybe you like watching films a lot, but can’t connect your TV? Well you now have the option to use the hard drive to watch the film via the Xbox One. Loading screens are one of the most annoying aspects in gaming and it doesn’t help with the gaming experience. However, the Seagate game hard drive eliminates long loading screens when playing games, since it uses USB 3.0. USB 3.0 is a lot faster than SATA II, which is used in Xbox 360, thus using the external hard drive to play games can actually make loading times a lot shorter. On the other hand, consoles like the Xbox One use SATA III, which is faster than USB 3.0, however the difference between them isn’t big enough to make a fuss about. Another great reason to get an external hard drive is the fact that they are portable. Simply having an external hard drive creates more options for yourself, since now you don’t have to use the drive with one console. Instead you will now be able to play anywhere, which is great for gamers who travel a lot. In addition, you can take this Seagate external storage unit to a friend’s or relatives house to play games that they might not have. 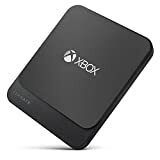 Perhaps where you live there may not be fast internet speeds, which means downloading games directly to your Xbox can take a long time, thus purchasing an external hard drive may be to your advantage. As now you will be able to go to a friend’s house or a location with fast internet and download games there. If for any reason your internal hard drive breaks then having a backup like the Seagate external hard drive would be a great quick fix. Of course if the internal storage of your Xbox breaks then it is very unlikely that the computer will function correctly, since that is where the OS is installed. However, you can quickly install the Xbox OS onto the hard drive and continue where you left off, thus not having to wait to replace your old hard drive. Most external hard drives are encrypted and if you do not know the password there is no way to get access. The Seagate game hard drive will safely store your personal files not allowing other users to access them, which is great for gamers who want to use this hard drive to play games and store media. In some cases drivers can detect bad files that would slow down the speed of the external game drive, thus eliminating the chances of catching a virus. In addition, this feature is great when downloading game files from PC, since there can be harmful files included when transferring games. Although the Seagate Game Drive for Xbox is not necessarily slow it’s still not as fast as the internal drive. Yes, it’s faster than last gen console Xbox 360, which uses SATA II. However, it is not faster than the newer Xbox One console, which uses SATA III. Based on this knowledge it’s up to you to decide if speed is a major factor, since getting an external SSD would be the better choice if speed is an important factor. When you first acquire this hard drive there will be two ways to format it, which is for media purposes or gaming. So if you’re the type of gamer who wants to watch movies as well as game then consider getting another hard drive, because with the Seagate hard drive only lets you pick one or the other: watch moves or play computer games. On the other hand, you can buy two of the same hard drives and format them differently, thus having more storage. If not looked after properly losing this hard drive is easy, since the dimensions are only 4.6 by 3.1 by 0.6 inches making it a very small. Furthermore, when travelling a lot this drive can get lost easily in luggage or be forgotten completely if you are in a hurry, which is why external hard drives can be a pain to use. However, if you’re sensible and pack correctly then this shouldn’t be such a big problem. In some cases you can actually overheat your hard drive to the point where it does not work, this is why external hard drives can be a pain. However, if you do not over use this product then there shouldn’t be a problem, since it takes a lot of computing power to overheat a hard drive. On the other hand, if you do see yourself using this drive almost all the time then consider purchasing a fan to cool the drive. Playing in an intense game only to see the screen freeze is every gamer’s nightmare, but what can you do to avoid this? With external hard drives there is really nothing you can do, if for any reason your USB disconnects you will lose any progress you have made in the game. Furthermore, over time USB cables become less and less durable making them a hassle to deal with, since you never know when you may disconnect from a game.